Posted on 8, February 2019 by EuropaWire PR Editors | This entry was posted in Chemicals, Energy, Gas & Oil, Italy, News, Technology and tagged Eni, Fahad Al-Sherehy, fuels, Giacomo Rispoli, Giuseppe Tannoia, high value chemicals, high value fuels, methanol, natural gas conversion, SCT-CPO, Short Contact Time Catalytic Partial Oxidation, synthesis gas. Bookmark the permalink. MILAN, 8-Feb-2019 — /EuropaWire/ — Eni and SABIC will join forces and R&D capacity to work on and develop further an innovative technology for natural gas conversion into synthesis gas to further be transformed into high value fuels and chemicals, such as methanol. The joint technology will be a truly innovative way of making synthesis gas and have it integrated into high value applications to achieve lower CAPEX and OPEX, higher energy efficiency, lower CO2 footprint and wide feedstock flexibility. Eni has developed this technology after an intensive R&D period and later combined and used with SABIC’s short contact time reactor R&D and their extensive knowledge of the integration of synthesis gas generation into processes to produce derived chemicals. Under the terms of the new agreement an Industrial Demonstration Plant will be built and operated inside Eni’s industrial premises to advance the technology further, which is based on the Short Contact Time Catalytic Partial Oxidation (SCT-CPO) of natural gas. It will further sustain the Eni and SABIC business by using the cleanest and lower GHG emission fossil fuel in a more efficient way. 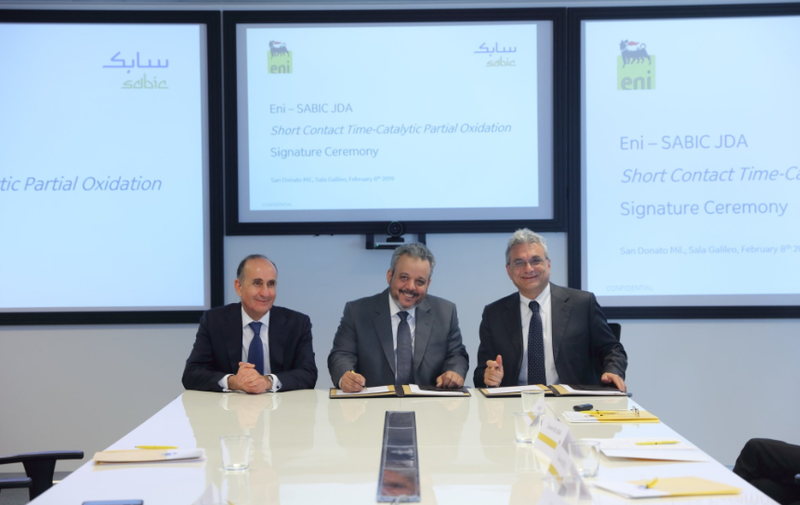 The Executive VP Technology and Innovation at SABIC, Fahad Al-Sherehy signed the agreement on behalf of SABIC while Giuseppe Tannoia, Executive VP Research & Development at Eni and Giacomo Rispoli, Executive VP Licensing & Supply signed for Eni. SABIC is the largest public company in the Middle East and Saudi Arabia. The company is active in petrochemicals, chemicals, industrial polymers, fertilizers, and metals. The Public Investment Fund of Saudi Arabia controls 70% of SABIC’s shares.